Bruce Park contains various amenities including: two baseball diamonds, a washroom/storage building and a large open space in the southern end of the park. The open space is also used for volunteer run skating in the winter. Two basketball half-courts are located in the central portion of the park while a playground with two play structures and swings occupy the north portion of the park. The park also includes an asphalt walkway to the playground, picnic tables and trash containers. During the summer months, Bruce Park is also home to the City’s Supie Program which offers free morning and afternoon drop-in activities (active games and crafts) for 6-12 year olds. For more information see https://www.hamilton.ca/parks-recreation/recreation/supie. In May 2019, the City prepared a request for quotation for the design and build of the spray pad. The project was awarded in October 2018 and the design completed in early 2019. 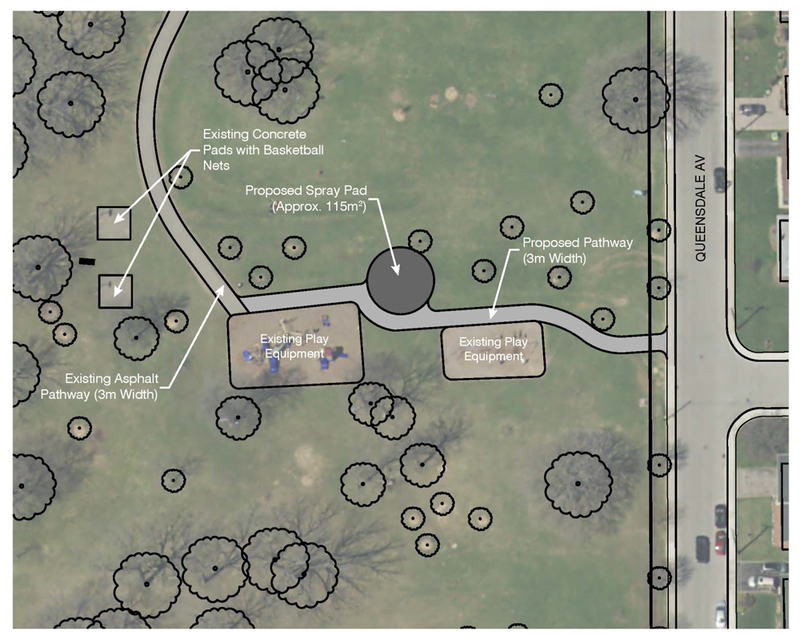 Construction of the spray pad, walkway and seat walls will begin in spring 2019 and completed in summer 2019. is currently preparing a Request for Proposal to design and construct a spray pad between the existing play structure and swing set. The design has not been finalized but will complements the existing play structures and neighbourhood. A new asphalt walkway will also be installed along the west side of the play structures to Queensdale Ave. E.
NOTICE: During construction, the park will remain open but certain features may be temporarily blocked off. Spring 2019 - Construction scheduled to begin. Anticipated completion Summer 2019.